Thank you to all the parents and staff for their participation in the Primary Parents’ Evenings this week. It is always a great opportunity to meet teachers and for teachers to meet parents and discuss each child’s progress. It was yet another busy week across the three campuses and I am always very proud to see how our pupils, of all ages, are so confident in performing or speaking as seen in the Spring Soiree and in leading assemblies. Most of my week has been taken up with interviewing for promoted posts for next session. I am impressed with the quality of staff we have here and it is difficult to choose when you have to make decisions. "The more people who know about the Global Goals, the more likely our leaders are to stick to them...I would be hugely grateful if you would share this video with your friends and family"
We’ve been sharing that video across our classes and with our school community and you can watch it here. In support of the Global Goals UNICEF have asked all Nord Anglia students around the world to complete a survey about their thoughts and hopes for the goals. You can complete the survey here. The survey closes on Saturday, 30 March, so please try to discuss the topics with your children and ask them to complete it by then. The results will be discussed at the UN in New York in July where Nord Anglia students and teachers will be attending a top level forum (hopefully including two students from our school) so this is an amazing opportunity for our students to have their opinions listened to and taken seriously at the highest levels. Students can learn more about the Global Goals and share their ideas and actions with the world using the new Global Goals Resource Centre which can be found on this page on Global Campus Online. Remember that you need to be logged in for the link to work. Workout Wednesday (Fit) – exercising for fitness. All students to wear PE kits day. There will also be Naked Lunches all week following on from the very successful day we had last year. A Naked Lunch is when our students will be asked to bring lunches that include as many items as possible that can be eaten or reused and as fewer items as possible that must be thrown away. The aim is to have waste-free days in school. You can help your child pack their Naked Lunch by including only what your child can eat, using reusable containers or bags, or buying non-perishable foods in bulk rather than individual snacks. It tends to be that the unhealthier snacks are wrapped in plastic, so, by including fruit and vegetables instead of them, lunches will be healthier and wrapping free. In the Summer Term, every Friday will be a Naked Lunch day! This week has seen the start of our healthy school activities. All pupils and staff carried out a healthy food audit on Monday, the results of which will be used to decide on the activities for the forthcoming week. It was lovely to see so many pupils perform in the Spring Soiree on Wednesday, from solo performers, to Ensembles and Key Stage choirs, the result was a fantastic showcase of talent across the school. The highlight of this week is watching the innovative way we teach pupils here at NAIS. Year 3 have been using the Virtual Reality glasses to support their creativity in writing about ‘The Firework Maker’s Daughter’ in English lessons. They are not the first year group to use this amazing new resource and I look forward to watching this develop further. I wish Year 3 and Year 6 safe travels next week as they head off on their residential trips, one to Sai Kung and the older pupils to Kanchanaburi in Thailand. It is the Year 7 and Year 8 performances next week and I look forward to seeing many of you there. Dates for your diaries as you won’t want to miss these great events organised by the PTA. Don’t miss out on this fun evening. Click here to secure your space. Following the success of last year’s Career Day, we are pleased to announce that this year the event will be taking place on Friday, 18 May from 1:30pm onwards. Please save the date – we look forward to confirming a number of organisations across a range of industries for our Year 9 and Year 10 students. Further information to follow. 6B produced a wonderful assembly today that demonstrated their learning during NAIS Hong Kong’s latest MIT challenge, ‘Street Smarts’. In class, 6B have been identifying the positive and negative aspects of self-drive cars and then using these arguments to write biased newspaper reports. Their assembly today was a fantastic showcase of their biased arguments. Secondary assembly was led by Mr Sutton and Mr Mackinnon with a focus on STEAM. Philine Kotanko 7D was announced as our secondary winner in the ‘Hack the bottle’ competition in which she designed and created an electric powered airplane. 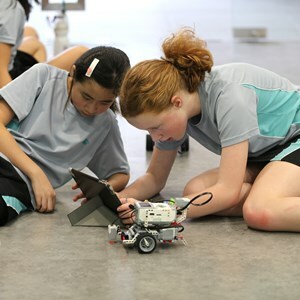 Philine will now be attending the STEAMFest event at MIT in May along with our other winners from year 6 who will have the opportunity to work along side MIT professors and other Nord Anglia student from around he world. Mr Mackinnon also shared some information about the Young Scientist Film Award competition and was delighted to announce that 3 videos submittted by pupils from our school have made it to the finals. Finally, Janice Ooi Year 9 paid tribute to world leading physicist Stephen Hawking who sadly died this week whom had made a huge contribution to the world of Science. On Wednesday, our ECA musicians performed in our termly concert – a delightful event showcasing our ever growing ensembles from choirs to string groups and wind band. Soloists Velvet Lung, Ardi Tse and Ally Cheung took to the stage and performed beautifully for the large audience! The choirs both performed songs reflecting Carol Dweck’s ‘Growth Mindset’ with ‘The Power of Yet’ from Sesame Street, and ‘Yes I Can’, a Sammy Davis Junior number used for the Paralympics in 2016. String Ensemble this term has almost doubled in size and produced a full and satisfying sound with ‘Chariots of Fire’ and both the Guitar Ensemble and Wind Band wowed the masses with their performances of ‘Beat It’ by Michael Jackson and ‘Soul Bossa Nova’. The Advanced Strings have really matured as a group this year and put on a beautiful rendition of ‘Nimrod’ from Enigma Variations by Elgar and ‘Allegro’ from the Telemann Concerto for 4 Violins. Our next concert will take place in City Hall on Thursday, 14 June! We are extremely excited to be taking this event to an external venue for the grand finale of the year and to have the opportunity to bring together students from all three campuses. Please save the date! Thank you to all parents who have sent in photographs of their children receiving their feedback at the Music Festival. We are truly delighted that so many students have practiced so hard and participated already with fantastic results. Congratulations to all students who have taken part so far, but in particular to Shinnice Sy who gained 3rd Place for her piano performance, Sylvia Li for 2nd place in the Guzheng competition and Ardi Tse for his performance of ‘Sonatina in Bb’ by Handel which gained him 1st place. We look forward to receiving more photographs as the festival continues! Sign up for next term’s instrumental lessons is underway! If you would like your child to join this programme and receive 1:1 tuition, please click here to access the contract and information on Firefly. Unless notice has already been provided for next term, all students currently receiving lessons will continue to do so next term. Some weeks ago, students from all over the world within the Nord Anglia family posted questions to dancer, choreographer and Juilliard Alumni, Flynn O’Reilly. He has now answered these questions with some extremely thought provoking and engaging replies. Congratulations to Dimitris Vallas, Serge Leung, Oliver Ansell, Angela Daniel, Samaira Singh and Pippa Marwood, whose questions were selected! Click here to access the Global Campus – students can log in using their school email address (firstname_lastname@nais.hk) and normal password for the school computers. Registration for the Summer Arts Programmes 2018 is now open! This year there are three available locations with a vocal programme running in Florida, a String programme in Shanghai and the flagship programme in Geneva which caters for dance, music and drama. These programmes cater for a wide ability range and Nord Anglia students can enjoy a 15% discount. For more information and to contact our dedicated Summer Arts team for further details, please click here. The highlight of my week was watching the wonderful Seahorses and Dolphins assembly. I know that the teachers and children have been working hard over the past week to speak in clear, loud voices and show off their learning to their peers and parents, and what a fabulous job they did. Well done to both students and teachers. The Year 1s also had a fabulous day at Lam Tin on Thursday in our maker space working with the Year 9s on our MIT collaboration and I look forward to them sharing their learning with our EYFS children on Monday. If you haven’t sent back your child’s Bee-Bot cover please do so on Monday. Some of the creative designs I’ve seen this week have been super. As part of our healthy schools week, this week we took a lunch audit and it was pleasing to see that many of our children bring in healthy options packed in reusable containers. During our healthy eating week we are going to try for whole school ‘Naked Lunch’. This is where we encourage for everyone (including staff) to use reusable containers that no-one has single use plastic wrapping for their lunch and snack. This is something very close to my heart and important to highlight to our children about the impact that plastic is having on our planet, particularly oceans and how we can all help minimise this. We will also be thinking about how to keep our minds and bodies healthy too. Year 1 Parents Evening: 3:00- 6:00pm. This is an opportunity to meet with your child’s teacher as well as Ms Li. ECAs finish. We will contact you further about ECAs for the Summer term. Please refer to the letter via email and our naked lunch challenge – that is where no food has disposable single use packaging. All children, including Year 1, will need to go directly to Lam Tin (we will reroute the buses). Parents of EYFS are welcome to stay and join in. Year 1 will be in class with the rest of Year 1. We will take all children back to Tai Tam by school bus. EYFS children will need to wear their PE kit with a House coloured T-shirt. End of the term. School finishes at 12:15pm so the bus will arrive 2 ½ hours earlier. Lam Tin finishes at 1:00pm. Dress up as a book character day. Starfish and Turtles: Thursday, 10 May, 10:00am. Nursery: Thursday, 31 May, 10:00am. At times children will need to be given medication from the doctor in school. If this is the case, please do fill in and send a ‘Consent to Administer Medicine’ form into school with the medication. This will be administered by our nurse and she may also contact you regarding this. The form can be found on Firefly in Tai Tam, Whole School Forms. This will need to be completed every time medicine is sent in. Can I please remind all parents to keep a spare change of clothes either in your child’s bag or on your child’s peg. We know that most won’t need them but we have had a few ‘accidents’ this week with no spare clothes. Sometime children don’t quite make it in time, as they are so involved in their learning! We do keep a small supply, but it has drastically disappeared this week. It’s been another busy week of learning at school. 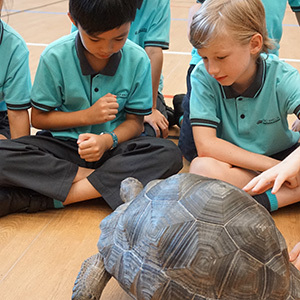 We finished last week with a ‘super’ treat from the Dolphins and Turtles, who shared an assembly on Superheroes with us. Their confident acting, singing and dancing was wonderful to see. This week the children started the week talking about healthy eating in assembly. The theme of zero waste was introduced and we talked about our ‘naked lunches’, which means a lunch with no packaging or single-use plastics. The children were excited to share their healthy lunches throughout the week and this has been great preparation for us to get ready for our upcoming Healthy Schools Week. Earlier this week, I attended a conference with Dylan Wiliam who is a world-famous authority on the importance of formative assessment for learning. 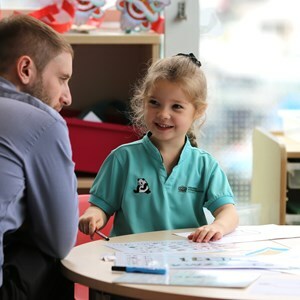 Since opening Sai Kung all our staff have been focused on continuous improvement of our practice so that we maximise the learning opportunities for all children. It was interesting to spend time discussing the research behind why we do what we do. As always, at school everything we do is based on learning and it was valuable to explore this in more depth. Over the rest of the school year, there are many activities planned to ease the transition of those children who will be moving to Lam Tin for the next school year. You will hear more about these over the coming weeks. Year 1 very much enjoyed their special MIT day at Lam Tin on Thursday this week. Please do check out the blog for more information of their day. I also wanted to thank all our parents who have filled in the parent survey for Nord Anglia. As a new school, it is particularly valuable for us to receive your feedback. We are always aiming to improve and working with parents is a crucial part of that. If you haven’t found time yet, you can still complete this, online, via the link here. As always, thanks for your support and enjoy the weekend. EYFS Sports Day. All Sai Kung children, including Year 1 will need to go directly to Lam Tin (we will reroute the buses). Parents of EYFS are welcome to stay and join in. Year 1 will be in class with the rest of Year 1. We will take all children back to Sai Kung by school bus. EYFS children will need to wear their PE kit with a House coloured T-shirt. More detailed information will be sent out via letter. Seahorses and Starfish: Friday, 11 May. Bumblebees and Caterpillars: Friday, 1 June. She taught phonics and grammar classes for a year and a half before working in Nord Anglia. She loves working with children. Feels joyful and proud upon seeing the growth of a child in their interactions and communication. When not in school, she likes reading but loves to sing and dance. She also loves to travel and take photographs of her encounters or the places she’s visited. I graduated from St Patrick’s College in Dublin with a BA in English and Irish before completing my PGCE at St Mary’s University in Twickenham. 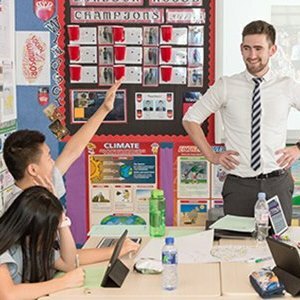 I gained a wealth of experience teaching in the UK and Ireland and then moved internationally to Qatar where I taught for 4 years prior to moving to NAIS Hong Kong. I am very passionate about providing a challenging and inclusive environment accessible to all children where they can explore their learning in a fun way. I believe that children who feel happy and are in a safe, secure and stimulating environment will be motivated to thrive in their learning. I enjoy active lessons and love to see the children busy in their learning. Outside of school I enjoy travelling and exploring different places and experiencing different cultures. I enjoy reading and attending different exercise classes. At the weekends I enjoy being outdoors and discovering new places around Hong Kong. There is also a section of photos from Sai Kung in general - you can find this in the “Welcome to Sai Kung” section on Firefly. We do have a small supply of spare clothes for emergencies, can we remind everybody to add a spare set of clothes to your child’s bag. These can ‘live’ at school on your child’s peg!